First of all, I post more smaller Mental Omega updates frequently on Twitter so follow me if you're interested in that. Now, turn up that Chaotic Impulse by Black Ice 9 and begin reading the new Mental Omega News Bulletin. It's gonna be a long ride. The underusage of fighter jets and bombers in vanilla Red Alert 2 and Yuri's Revenge was something many modders could not leave without changing so over the years you saw many aircraft and airfields created for the Soviets and Yuri in various mods. 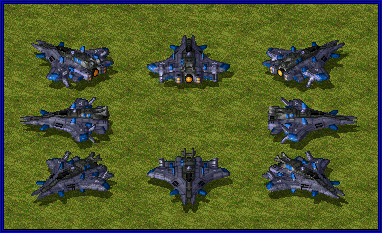 Mental Omega expands the array of buildable aircraft for all three original sides as well. While the 2013 release did not include the airpads for Soviets and Yuri's side, the next version will. The addition of new jets is not limited to the standard tech trees however, as the Allies will now be able to steal the technology which is required for the construction of the Lionheart Bomber from the Soviets. The new stolen technology roster: 10 units to go. The Lionheart is designed to destroy large groups of Soviet tank divisions with an experimental payload. 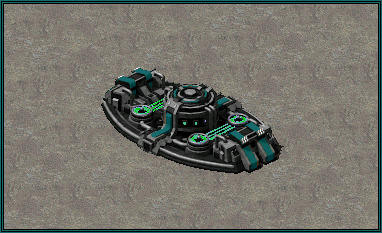 The bomb which is dropped from this unit will additionally induce EMP effects to all vehicles that survive, immobilizing them for quite a long time and rendering them vulnerable to enemy attacks. The Lionheart can perform a single strike before it has to go back to the airfield and reload, and thanks to Ares DLL it will take as long to reload this one bomb as it takes a Harrier or Black Eagle to reload both of its projectiles. The weapon is also effective against infantry but will not deal much damage to structures. As is the case with most of the jets, it should avoid anti-aircraft fire as its armor cannot take a lot of punishment. This is the only mechlunit for today. We'll now focus on the Foehn Infantry, which is trained at their Barracks. 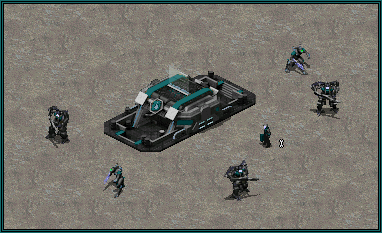 The Foehn Barracks is one of the most recognizable buildings you'll see in a classic Command & Conquer faction tree: it allows you to train infantry. There is a little twist to these however, as they are larger and more expensive. Advanced technology is required to create the weapons and power suits Foehn troops need in this building, the major part of which is already hidden underground. 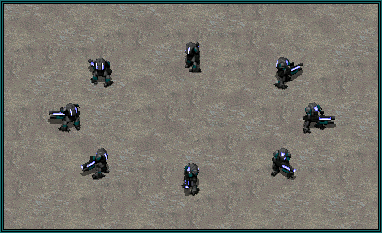 These Barracks can train and equip powerful solders, which outclass the other basic troops in one-on-one combat. However, the Foehn Revolt is limited in numbers. Their vehicles and troops are expensive to get and it is noticeable from the very start of a battle. There will be no large armies - only specialized strike forces and important decisions to make on how to manage them. The Knightframe is Foehn's basic anti-infantry.. infantry. The large exoskeleton which these troops are equipped with enhances performance and survivability in battle and also helps carry the large next-gen machine gun which can not only mow down enemy soldiers and light vehicles, but target flying objects as well. The Knightframe is both the basic anti-infantry soldier as well as the anti-aircraft weapon of the Foehn Revolt. The size of the exoskeleton makes it impossible for normal-sized tanks to crush him. Do not be fooled by the exoskeleton's size - the Knightframe has no issues with adjusting its construction accordingly to the environment it needs to reside in. The Knightframe can garrison various structures just like the G.I., Conscript, or Initiate and fire from within the building. However, it will not be able to fire at aircraft when inside a building. The Lancers are soldiers who decided to go one step further than Knightframes and become one with the machine to further enhance their combat abilities. These soldiers use cybernetically augmented legs to outrun most of the troopers on the battlefield and keep up with vehicles, which are their primary targets. The Lancers' short range sonic weapons combined with their high durability results in a force to be reckoned with or even outright avoided when anti-infantry weapons are scarce. The sonic projectile will pierce through multiple targets and even rebound from the physical objects to deal additional damage to nearby units before it disperses. A Lancer's body cannot be crushed by ordinary units, which means that taking them head-on might be a mistake. Whatever is left of the Proselytes, the few still in power remember to keep their tanks at a distance when a Lancer team closes in. The Huntress is the most important member of every solid Foehn infantry strike force. The reason for that is her weapon: her gun is a small high-tech nanoids container, which upon the Huntress' command is opened and the nanoids inside are released towards the target. 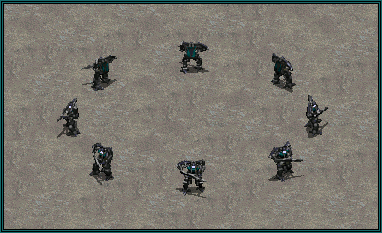 The nanoids have a very specific mission: to devour any infantry in their way and keep whatever materials could be reused for Foehn's purpose. There are several characteristics that are shared by all Foehn infantry and this is one of them: the advanced suits worn by their troopers are compatible with the nanoids released by the Huntress. After "consuming" an object, these nanoids will be able to repair damages and heal the wounds of Foehn infantry nearby for a short while. 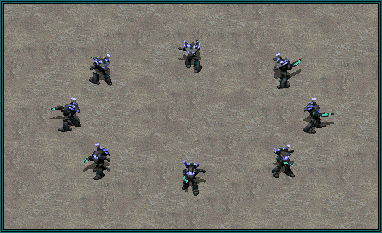 Once an enemy infantry is eliminated by Huntress' nanoids, a temporary nanocloud is created in which all of your troops will be healed/repaired with the salvaged materials. Foehn units can receive many benefits from active battles and this is one of the most important ones. In desperate times, a Huntress can direct her nanoids at friendly infantry to achieve similar results. This is extremely questionable however when the amount of troops at Foehn's command are so limited. While the Huntress has no anti-unit weapons, she can use her nanoids to take out the pilots of enemy tanks at close ranges and take control of said vehicle in a similar fashion to the Hijackers. Once a hijacked vehicle is destroyed, there's a high chance she'll survive and be able to steal another vehicle. The Clairvoyant is the Foehn's infiltration unit. It does not disguise, however it is much cheaper than an ordinary spy and has the ability to traverse through water. With the use of Spinblades its speed can be vastly boosted, which is useful especially during the infiltration attempts. The low price changes the way Foehn acquires enemy tech. 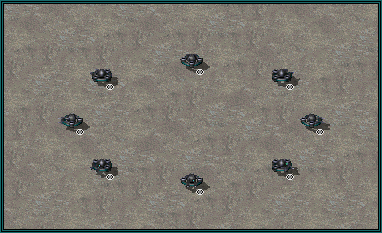 Waves of drones are used to swarm important enemy buildings. Due to its mechanical construction, Dogs and Spooks are unable to deal damage to it. 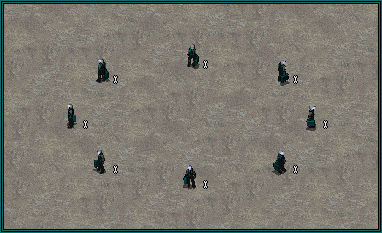 Additionally, the Clairvoyants will be able to react to disguised spies and stealth units which belong to the enemy. They have a short range immobilizer which will stun enemy spies and keep them in place for as long as a Clairvoyant keeps firing at it, making it a clear target for you to eliminate. Inside a Jackal Racer the Clairvoyant receives a large range boost. This is not all there is to it! If you use this building's special power on any of the infantry above, you'll be able to control MOre. This is the Nanofiber Loom, a crucial building in the Foehn tech tree. Once a Nanofiber Loom is placed on the battlefield it will begin preparing the Nanofiber Sync support power, which can transform Foehn infantry and give them new abilities. With the infusion of nanofibers from the Loom, weapons and even entire powersuits of Foehn troops will be heavily modified, providing the commanders with additional strategic choices during the battle. As a support power that needs to recharge, costs plenty and has a limited radius (although it can be fired anywhere on the battlefield), the Nanofiber Sync is a powerful tool which puts an emphasis on decision making as the new weapons you can achieve with this power are very effective but limited in numbers. Quite often the transformation into the alternate forms also sacrifices a feature that the normal version of the trooper has. Here are the second forms of the soldiers presented earlier. Once a Knightframe armor is infused with the additional nanofibers it becomes the Kingsframe. While no longer able to target aircraft or garrison buildings due to the sheer size, the Kingsframe obtains an imploder cannon which deals great damage to enemy structure and infantry in a small radius. Enough Kingsframes will level any base quickly and with little resistance. The nanofibers make the exoskeleton even more durable, making it immune to crushing by any object, including the omnicrushers. The Lancer's weakness is its short range, but its advantages include high speed and decent effectiveness against enemy structures in the early game. However, to counter the longer range anti-infantry units a personal plasma railgun has been designed, similar to the ones used by the Mastodon but with a significant firepower decrease to reduce the time required to charge the weapon. After using the Nanofiber Sync on Lancers, a Railguneer is created. This soldier trades speed for the heavier railgun with a long range and an additional armor around its cybernetic body. In a similar fashion to the Kingsframe, this power suit becomes immune to omnicrush and can no longer garrison structures. While the Irritator is not available to all Foehn subfactions, the weapon casually referred to by their soldiers as the "confusion ray" can be accessed by each one of them through the use of Nanofiber Sync on the Huntress. The Deviatress' sole purpose is to bring enemy forces into disarray with the use of her long range device. Her emitter does not have a spread similar to the Irritator, she can only target one object at a time but compensates for it with an accuracy so good she's able to affect flying units. 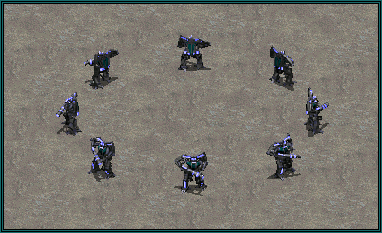 With an altered purpose, the Deviatress is not able to hijack enemy units. Sacrificing its infiltration and amphibious capabilities and the ability to increase its speed with the Windspin, the Clairvoyant turns into the Duplicant - a killer device which stalks its prey and devours it whole at the most unexpected moment. The artificial intelligence inside a Clairvoyant is completely repurposed after the Nanofiber Sync to control nanoids in its body in a similar way the Huntress controls hers to disintegrate the enemy infantry. 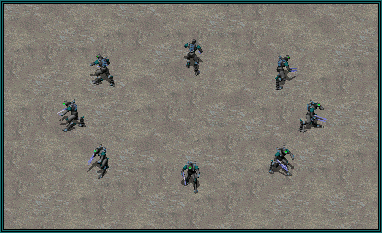 However, instead of reusing the acquired materials to heal and repair the damaged troops, the Duplicant will try to use all of them to create additional copies of itself. The process takes a short while, enough for enemy soldiers to try and fall back if any of them fall victim to the Duplicant's "devouring" process. ..oh, and there's also the obligatory Engineer, but he doesn't get any special powers yet. This news post does not reveal all of Foehn's infantry of course. There is still Tier 3 and heroes to come. We've recently finished the Cooperative Playthrough, which means we can entirely focus on new content from now on. There's been a major update to the Soviet Co-Op mission Ego Ergo Hax with Yunru. Here's what it looks like now. Edited by Speeder, 27 April 2016 - 01:06 PM. So, Halo Elites become TT Zone Troopers, KW Zone Raiders become TT Zone Raiders? Nice twist with the infantry upgrades. Does it also heal the units up when they're being transformed? Edited by Plokite_Wolf, 27 April 2016 - 01:45 PM. Yes it does, but it also cancels their veterancy level. So technically, it's a repurposed Genetic Mutator SW? Interesting! Does it play unit lost when you fire it on your own troops? I'm assuming Clairvoyants are tier 2, due to the fact that all stealth detector infantry are, so far, but then again it wouldn't surprise me if they were their tier 1 scouter, given the fact that they wouldn't have one otherwise and that their barracks is more expensive. Regardless, they are still a very low tier spy unit, which doesn't look good for balance, especially if they can be amassed, too. - Make it so they steal less cash, for the sake of balance. - Make it so they sabotage power for a shorter duration, for the sake of balance. - Make it so they give off an alarm when they catch a spy, to further indicate that there is a spy. So, are these all tier-1 infantry, and the Nanofiber Loom alters them into their tier-2 ones? Edit: It would be cool, imo, if the Engineer was the Huntress, capable of using nano... things... to eat and alter structures. Can nano stuff eat structures? Soooo, Lancers are like Attack Dogs for Tanks? interesting. Edited by BlackAbsence, 27 April 2016 - 06:04 PM. There's a difference between a support power and a support superweapon. Nanofiber Sync is not a superweapon. Oh trust me. Even amassed they will have a lot of problems breaching base defences. And walls ofc. Sending spamwaves may work... after n'th time but surely its not helpful to your economy and unit production. Would be interesting if the Nano Sync could be used on non-Foehn infantry as well, but all of them would create a neutral/hate-all Nanomutant, kinda like a visceroid. Other than that - aside from Lancers being Halo Elites (not judging, just noticing), all these are awesome! Sounds very different and unique from other factions. One question, though - are "synced" units vulnerable to dog attacks? Forgive me if i missed that detail somewhere. I'm really looking forward to playing as the Foehn . Will you put in a secret super stolen tech unit like the cyborg commando in the previous release ? Edited by Eternity 6, 28 April 2016 - 05:40 AM. Those Lancers are most definitely Elites. It feels unwise to reuse assets, given the precarious nature of C&D. Microsoft has a particularly bad hair-trigger, considering they shelved a Generals mod in favor of Halo Wars. Apart from that, superb presentation here. Seems like the Foehn's shtick is bionics, ala the Ordos of Dune. But Elites are blue. Clearly this one has a glowing Visor Helmet and just had mechanical legs. That 'blob of pixels' might just resemble one. Pure coincidence. I don't even know what Halo is. Location:ERROR: This guy is out of this world! One and only developer of Supreme Command & Conquer mods. Edited by Solais, 29 April 2016 - 03:33 PM.